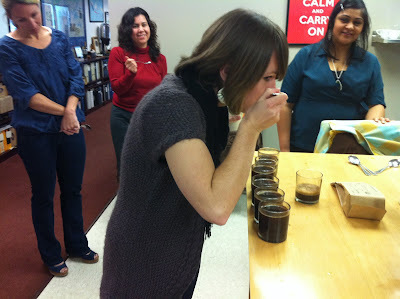 The SCAA staff doesn’t get opportunities to geek out on coffee in the office as often as you’d think. Particularly this time of year when we are all so focused on The Event, we rarely have time to take a moment and really focus on the thing that brings us all here-coffee! 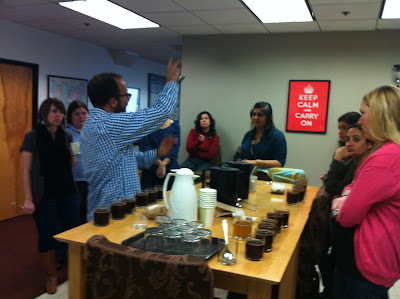 However, we were lucky to have our SCAA President, Peter Giuliano of Counter Culture Coffee with us today and he took the time to do an impromptu cupping with our staff and teach us how to recognize flavor profiles. The coffees we cupped were Valle del Santuario (Peru), Buziraguhindwa (Burundi), Jagong Sumatra, and a microlot-Buziraguhindwa from Burundi. The flavors that emerged included honey and almond notes as well as citrus and dark chocolate. It was great to take a moment to relax and learn about cupping from one of our most dedicated and enthusiastic (not to mention knowledgeable) members. Thank you Peter! Previous Post Previous post: SCAA Board of Directors Elections Now Underway! Next Post Next Post: Studies show 58% of consumers planning to consume more yogurt based drinks within the next two years*.